Unusual. Challenge yourself to rethink your ideas about what subjects are appropriate, and then challenge yourself again to find an unusual perspective on your subject. 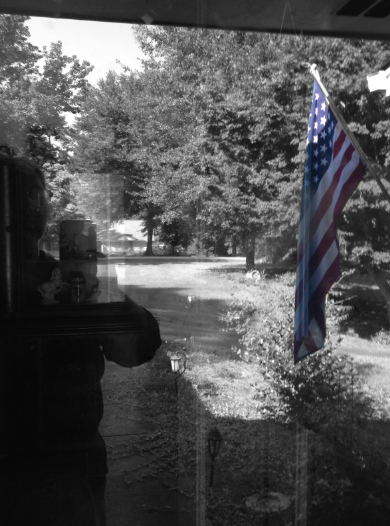 This picture is a selfie, a reflection of my front yard off the glass storm door. Every time I walk through this way, I adjust the American flag that we fly proudly on our front porch. The wind blows into the corner and tends to catch the flag and flip it once, sometimes twice, around the post before I notice it and straighten it up again. I do this week after week until it’s time to retire the flag for the Boy Scout Troop at our church, and we put up a new flag. I woke up in a reflective mood. It’s been a crazy week with news of war, and in spite of rhetoric, sometimes artfully deceptive, but mostly absurd, I feel no more hopeful than when all of this started. It stings to be talking of war on yet another 9/11 anniversary, one that is now doubled as a reminder of unresolved Benghazi questions. I was going to let today pass with just some private reflection. Prayer. A visit to the Adoration chapel at the church down the street from where I work. But then I thought, no. I like this picture; I’ll post it today. I like that the flag, though caught in dim light, it’s color starting to fade, is the focal point. Though everything behind it may seem colorless, you can see I’ve played up the colors in the flag. I like that, and my prayer is that we always exhibit those qualities as a nation.